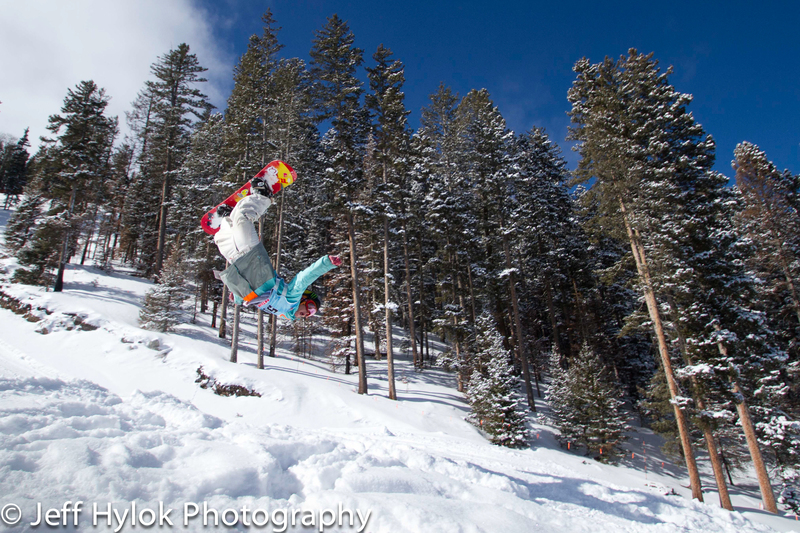 Spending a significant amount of time at a ski area means I have a ton of terrain park photography stock. The gigs are logistically pretty straightforward. The parks are usually small enough to walk around without too much work. Competitions involve multiple runs from each of the competitors, so you’ll have several opportunities to dial-in your shooting and learn who the hot shots are. If you didn’t get the first shot, chances are you’ll have a second or fourth opportunity (especially key if you’re on the wrong side of the slope for the goofy or regular footed boarders). Best yet, a sunny day can provide boatloads of light, and you can get away with using only available light. The downside is that your portable lights are pretty outgunned if you do try and use them on the snow. Here’s some things to keep in mind while taking photos in the trauma terrain park. Snow: the biggest reflector you’ll ever use. If you’re lucky, your photo shoot will be on a bluebird day with plenty of sunshine. You’ll have so many photons at your disposal, it’s fantastic. That way, it’s not critical that your subject is facing the sun. The snow will provide a ton of fill, that’s actually pretty much the same color temp as the sun. Even if there’s shadows, you’d be surprised how well you can bring-up the shadow detail during post processing. Also, you can shoot at blazing shutter speeds and easily freeze the action. My camera usually lives in aperture priority mode. I’m usually more interested in controlling depth of field before shutter speed, and I can usually dial in the exposure with a click or two of exposure compensation. With snow, I’m still trying to learn how my camera’s light meter algorithms read the image. Sometimes aperture or shutter priority will give me spot-on exposure without compensation, and others I’ll get something way under exposed. I’ve learned to embrace manual mode for snow, and chimp the histogram to make sure it’s skewed to the right. Sometimes I get away with clipping the highlights a little bit. The histogram is actually built on a jpg thumbnail of the image, whereas I actually shoot only RAW files. Often the true RAW file is just less exposed to clipping the highlights, or a little post-process exposure adjustments easily brings down whatever is clipped. I won’t go into composition techniques today, but you probably already know that dead-center placement of your subject usually isn’t the most compelling composition. Wherever I place my subject, I’m usually choosing an off-center focal points to drive the proper placement of my subject, and fight like mad to keep that little box on top of the flying streak in my viewfinder. My primary camera is a Canon 7D, which give you the fexibility to use a single point, a group of four or five points, or even a 1/5th of your viewfinder as the focal point. Each method has it’s place, depending on the speed and size (relative to the viewfinder) of your subject. It takes me a couple passes before I figure out which one will work best for my subject that day. As for focus methods, I mostly use the constant auto focus method (Al-Servo, in Canonspeak) for my action shots. The autofocus isn’t bulletproof, but I’ve had great success most of the time. Pre-focusing can work well too, if I’m running a higher aperture and the distance to the subject is consistent. Sometimes I resort to pre-focusing when using my Tamron 10-24mm superwide zoom lens with action shots. The image quality of the lens is great, but the autofocus can be a bit pokey, and I’ve missed some shots because of it. If I pre-focus, I’m left with just the good images that the lens is capable of producing. I’ve never had problems with Al-servo and any of my Canon lenses (17-35mm, 24-105, or 70-200), and therefore usually stick with the Al-servo. I love shooting mountain sports (skiing, biking) with a wide angle. The lens distortion adds visual tension, exaggerates how big things look (actually making them appear like it feels if you were on the other side of the lens), and often drives big arcs in the image which can help direct the viewer. With this fisheye lense, I’m actually about four feet from the rail. One downside of the wide lens: you have to get close, sometimes uncomfortably (not safe) close. 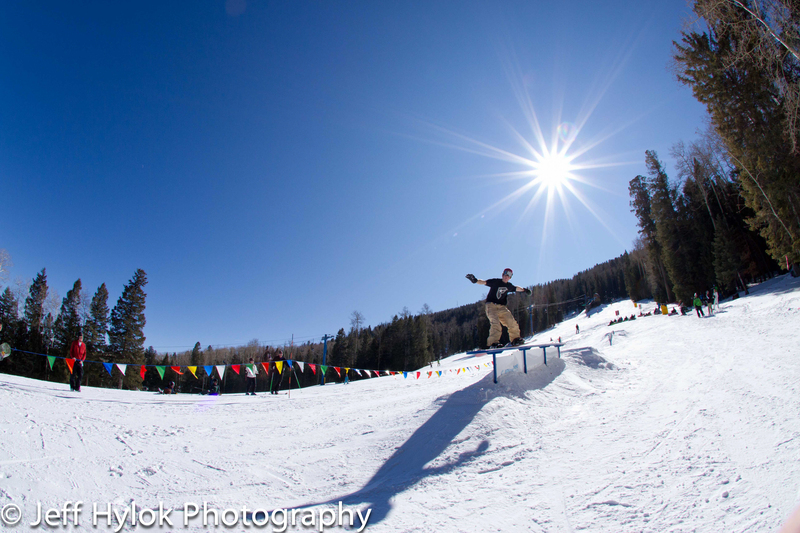 Using a fisheye lens can get you hit by your subject when he or she bails off of the rail. Always keep an eye out for where your subject is heading and look for a good protected spot to perch. 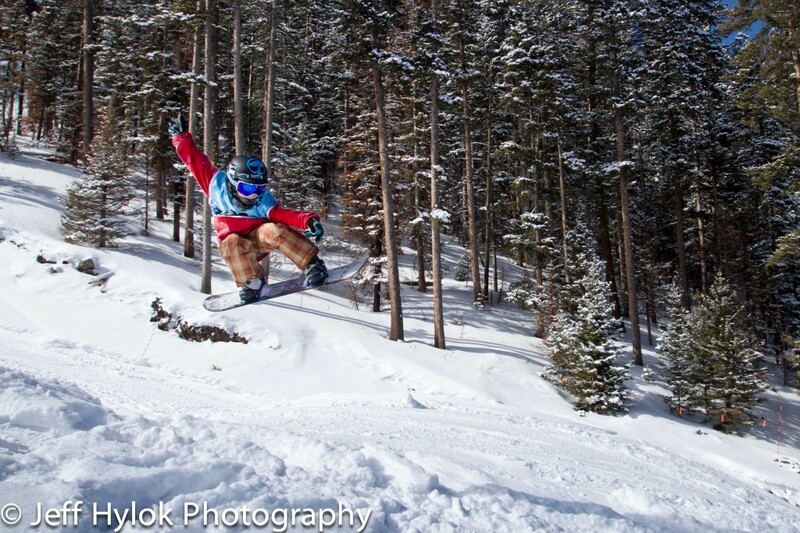 I’ll hide behind trees, next to steel rail structures, whatever, but I’m always on the lookout of the skier who looses an edge before hitting the kicker. Along with the one-eye thing, always keep in mind that while these events can be thrilling to shoot, they can be dangerous for the rider or you. Keep your wits about you, and always know what to do if someone on your shoot gets injured. You don’t have to be an EMT, but at least have your cell phone at the ready, and know who to call if things go south. More than once I’ve been shooting ski shots while on ski patrol duty, and have had to call-in an accident that happened in front of my lens. 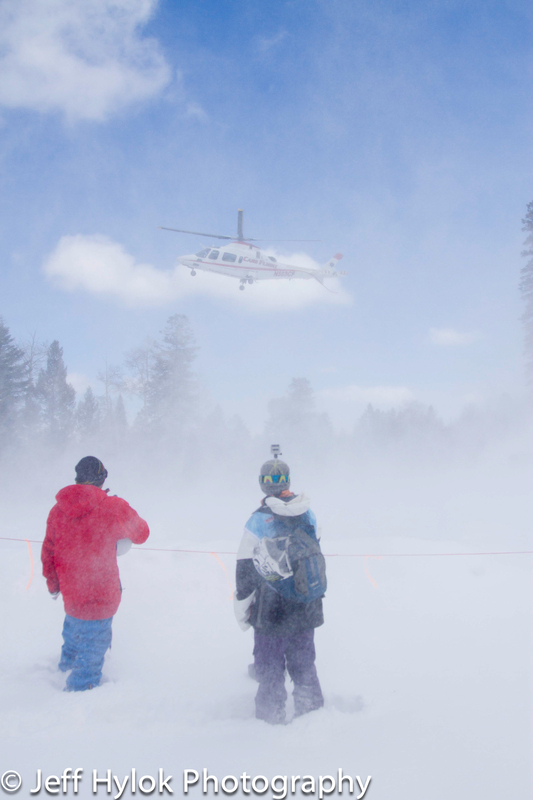 One skier didn’t complete his 720, was knocked unconscious on the landing, and got a helicopter ride to the hospital. He was eventually fine, with only a concussion and broken collarbone. I got a kick out of his buddies who filmed the whole event on their GoPro. Good thing, since the patient probably didn’t remember a thing. 90% of the time, everyone has a great day, and you’ll walk away with some fantastic shots. Good luck and have fun on the slopes!